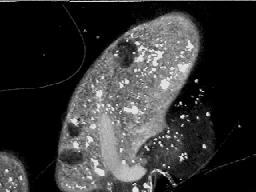 Paramecium Caudatum - Exposed to 1150 Hz RF Excited Plasma Tube - Undergoing Evisceration, Membrane Transport Disruption, and Disintegration, from Plasma Wave. A new book is available as of January 2012, authored by Dr. Andre Bellossi and Pr. Gerard Dubost, which has a full chapter devoted to the Rife-Bare device, and other chapters which mention and evaluate aspects of the device's usage. This is a technical book, with discussions upon the physics and biology of EM fields . It is an ideal college level text book that should stimulate discussion and inquiries within the scientific community of EM field frequency devices. If you are considering donating to cancer research, please give some thought to this 501(c)(3) non profit cancer research group. Funding is necessary to further development of their initial highly promising results obtained by utilizing EM fields on several different cancer cell types. More has been accomplished in a very short period of time, than many avenues of conventional research have accomplished in decades. Just click on the research button, and then on the cancer button, to see reports, charts, data, and some amazing video's what has been accomplished to date . AVI video of exploding Blepharisma organism after exposure to the plasma wave generated by the Rife/Bare instrument. 1.9MB, needs Windows 3.1, 95, 98 or other AVI viewer.Run time is about 15 seconds. There are also videos of the effects of the device on Google Video. Simply do a search using the terms Rife/Bare. This web site will remain as a research source for those interested in frequency devices. The authors research and developments have been oriented towards improvement of a frequency device first created and tested in the 1930's by Dr. Royal Rife, and then lost to humanity for the next 65 years. The many intervening decades from Dr. Rife's time to our present day has seen the discovery of many new cellular physiologic mechanisms. It was not possible until the past few years to explain how Dr. Rife's instrument functioned. The old concept of mechanical resonance - "shake it till it breaks" is highly limited and the actual mechanisms behind the effects of frequency devices are quite biologically complex. This knowledge has led the author to improve upon the original device, and to obtain patents. Patents which protect the unique methods, electrical concepts, and abilities to create cellular physiologic manipulation, of the modern day Rife/Bare device. Dr. Rife's Device or as some call it, a " Rife Machine " is a highly misunderstood instrument. This misunderstanding has arisen in part due to what people expect of the electronics, and the reality of how the device operates . Another set of misunderstandings have arisen from Dr. Rife's intentions for his device. Dr. Rife focused upon the destruction of micro organisms and viruses. The concept of physiologic manipulation using frequencies was not Dr. Rife's focus or intent. The original Rife Instruments used a radio transmitter to excite a gas plasma formed within a glass tube. The emissions from the plasma inside the tube were what produced the devices capabilities. In other words there are two important aspects to the device. First, there is the driving electronics, and secondarily, yet most important , the plasma tube. Both the plasma tube and the electronics play a crucial role in the ability of the device to create physiologic effects . Modern Phanotron type plasma tube, made in the Ukraine by Econika, for use with a Rife/Bare device. A plasma tube as used in these types of instruments should not be considered as an RF energy antenna! 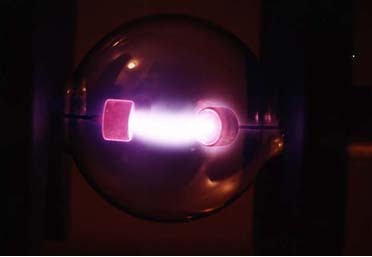 Plasma tubes as used in these types of instruments convert the RF energy into other types of Electromagnetic energy. In fact, a well coupled plasma tube in a modern Rife/Bare system converts over 99% of the input RF energy into other types of Electromagnetic energy. For example this means that if one were to use a 150 watt transmitter to drive the tube, less than 1.5 watts of RF energy would be emitted from the tube ! A few of the manufacturers web sites making plasma tubes for Rife/Bare device's can be found on the Links page. The modern day Rife Instrument developed by the author, has been named by it's adherents the Rife/Bare instrument. The Rife/Bare instrument, like Dr. Rife's, utilizes both a radio transmitter and plasma tube to create physiologic effects. It is the significant differences and improvements between the Rife/Bare instrument and Dr. Rife's original device that has resulted in the awarding of patents to the author. An example of one of the differences between a Rife/Bare and a Rife Instrument is that the plasma tube of Dr. Rife's device was placed within 8 to 12 inches from the to the patient to work. The author's patented discoveries have created a device which allows the tube to be used about 6 feet ( two meters ) or more from the exposure subject. There is evidence, that the wave emitted from the plasma tube of a Rife/Bare device, if un-impeded by walls, has an effective radius in excess of 30 feet. An effective field of up to 30 feet (9 meters ), makes a Rife/Bare device usable and the only device of it's type in the world capable of , treatment of the contents of large areas, volumes, and surfaces. There is a wealth of published papers available on the physiologic effects of various types of electromagnetic fields. The Rife Research Europe Web Site has numerous published and presented papers on these effects. This web site includes papers on the physics of action of the Rife/Bare device. Another web site that is a wonderful resource for Electromagnetic field physiologic effects is the EMF Portal . Unlike many frequency devices on the market, a Rife/Bare device stands freely on research supported physiologic mechanisms, published and scientific conference presented papers, and internationally patented uniqueness of operation. Frequencies utilized to create physiologic effects originate from a variety of sources. Many are empirically derived. That is, from observed responses based on application. Some originate directly from Dr. Rife. Spread Sheet Calculators have been developed which allow for the creation of frequencies using known principles of physics. Others come from a patented theory derived by Charlene Boehm. Ms. Boehm has a wonderful website with more information about this patented process which has demonstrated excellent effectiveness. Nearly all effects of a Rife/Bare device depend upon the phenomena of resonance. The wave emitted from the device easily produces resonances in many different manners! The device is capable of producing acoustic, electrical, and magnetic resonances. Resonators that are "closely coupled" by both frequency and phase can cause the transfer of energy from one resonator to another. Please see the links page for links to web sites with frequency lists. 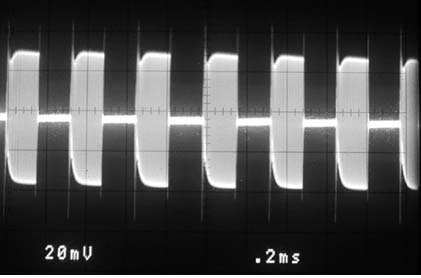 Output wave from plasma tube of Rife/Bare instrument. A new term was created by the author for the use of resonant energies to create physiologic effects. This is an acronym of Dr. Rife's name. The various EM waves emitted from the plasma tube of of a Rife/Bare device create an evenly distributed field that has excellent whole body penetration. More specifically it exposes the entire body at once with enough energy to work with all sizes of people. A Rife/Bare device, via what is known as Faraday's law automatically compensates for a small animal, child, or an adult! One can put a small animal in the field produced by a 200 watt device and not have to worry about over exposure due to the strength of the field! Faraday's law also plays a part in what is known as "Evanescent Wave Coupling". Plasma tubes produce evanescent EM waves, and the properties of the evanescent waves are based upon the applied modulation frequency of the tube, the gas within the tube, the dimensions of the tube, and the gas pressure of the tube. Evanescent wave coupling allows energy to "tunnel" almost without loss, from the plasma tube to a resonant object. Different gasses produce different spectra ( colors ) , and thus will produce different resonant/physiologic effects. Neon for example is vitalizing, sedating, warming ( due to its Infra Red output), muscle relaxing, and pain relieving. Argon has a very wide spectral emission, and thus is the preferred gas that is used with a Rife/Bare device. It is vitalizing, cooling, sedating or stimulating depending on the applied audio frequency. Argon can also be pain relieving, and most importantly ,it has intense devitalizing and in some cases destructive effects on micro organisms. Helium Gas has it's uses too. Helium gas runs very hot - and gives off a lot of energy in the Infra Red regions. Helium gas has also shown to have intense devitalizing and destructive effects on some micro organisms. The electrical charge on a cells various membranes plays a key role in the health of a cell. When a cells membrane voltage is diminished, a cell can become subject to infection by viruses and attack by bacterial toxins. Some bacteria activate genes that cause virulence ( disease ) when in the presence of a cell with a lowered plasma membrane voltage. It is easy to hypothesize that any additional charge added to the body by a Rife/Bare device may play an important part in the maintenance of health. Some simple tests need to be done to determine this. A researcher could easily determine pre and post exposure membrane potentials, decrease of any additional potential with time, resistance to infection, frequency response, virulence gene down regulation, and so on. The full capability of the Rife/Bare device to direct and promote physiologic processes , is just beginning to be understood. Empirical results are significant, and the potential implications of those results will eventually result in a complete paradigm shift. A discussion about the Rife/Bare device, written by an engineer can be found at this site. Muscle stimulators which relieve pain, reduce spasms and edema, tonify weak muscles, and assist the healing process, run at from 1 to 130 Hz. TENS units are used to block pain run at about 80 to 100 Hz. Interferential Therapy units are a type of muscle stimulator run at 3000 to 4000 Hz. Bio Feedback instruments used to modify behavior and retrain the nervous and muscular systems, run from below 1Hz to about 40 Hz. Bone Growth Stimulators, used to heal broken bones run at frequencies from about 40 to 80 Hz. Deep Brain Stimulators - use implanted electrodes to impart electrical pulses from between 120 and 160 Hz directly to the brain to control involuntary muscular tremors in Parkinson's disease. Heart Pacemakers use an electrical impulse to regulate the hearts rhythm. These are just a few of the electrical frequency devices in use. The use of the Rife/Bare device on disease in humans is worthy of further investigation in a more appropriate clinical manner. There has been significant University level, and government funded research done in the past few years into the effects of pulsed Electro Magnetic (EM) fields on cancer. Pulsed EM fields have been found to inhibit the formation of new blood vessels so necessary for cancer growth. Pulsed EM fields increase the uptake, diminish the dosage, and improve response to many different chemotherapy medications. Pulsed EM fields can cause cellular death through the processes of apoptosis and necrosis. By stimulating cellular protective mechanisms - it is possible to develop a selective immunity to a specific cancer via the usage of Pulsed EM fields. To summate; published, peer reviewed research has shown that pulsed EM fields will inhibit tumor growth, cause tumor regression, and create immunity to cancer. Completed machines built under license to electrical specifications of the inventor, are available from Resonant Light . The licensure contract ensures that reliability and service to the customer is paramount. Purchasing a Rife/Bare instrument is knowing that the device is based upon sound scientific and electrical principles, and not just marketing hype. A Rife/Bare device is not a substitute for other viable treatments that may exist. The only way to judge any response from the device is with laboratory tests! Simply because one may feel better from whatever treatment is tried is not necessarily a reason to believe that a disease state is improving. Due to the large number of sites now offering information and research on the Rife/Bare device, a separate link page has been established. The links page also lists web sites which sell assembled devices, plasma tubes, square wave generators, and all the other parts necessary for construction of the device . The use of pulsed fields in the treatment of disease is an area of growing scientific research and interest. Please visit the following sites for more information.